Our trip began at the permit office in Lone Pine, with the hope of grabbing a walk in permit on the Saturday of Memorial Day weekend. This is not advisable if you are going to be disappointed to find your trail of choice is full, but I was willing to be flexible. The visitor center was crowded as expected, and after a half hour wait I scored the last available spot for a walk in permit up the North Fork of Big Pine, which was my first choice. I had a few backup trips in mind but it’s always nice when a plan works out. We headed out from Lone Pine at 10 and by the time we hit the trail up the road from Big Pine it was already 11:30. The trailhead here is lower than usual for the Eastern Sierra, at a little under 8,000 feet high, which means that it can become pretty hot on sunny summer days. The temperatures in Owens Valley were in the mid-nineties, but the clouds in the upper elevations helped keep things relatively cool. Speaking of clouds, the area had recently received an early season snow storm that blanketed the upper areas with close to a foot of wet snow. The forecast for the weekend predicted the slight chance of afternoon thunderstorms, so we tried to maintain a good pace to make sure we reached camp at an adequate time. The initial views from the trail are of the South Fork of Big Pine, where Callie and I got accosted by mosquitoes last June. The recent dusting of snow highlighted the contours of the rugged peaks which resulted in a fantastic view of the range. After close to a mile, the trail branches off into the valley containing the North Fork. The views are initially less impressive than those looking up the South Fork, and there continues to be very little shade along the trail. Honestly, this is one of my least favorite stretches of trail in the High Sierra, but the eventual payoff makes it well worth the effort. Around the two mile mark, about a thousand feet above the trailhead, the trail begins running alongside Big Pine creek, and things become much nicer. For one, the sun scorched dusty trail is replaced by more traditional Sierra scenes, as the trail meanders through a forest of Cottonwoods and Pines. On top of that, views of the Palisades begin to open as well, whenever the forest allows it. As the trail begins to get close to the chain of Big Pine lakes, the humongous Temple Crag begins to loom over each scene providing a glimpse of what is to come. After five miles of hiking and two thousand feet of elevation gain, the trail reaches a junction right before First Lake. The trail towards lakes 1-7 is far more popular and crowded, but it covers some incredible Sierra lakes so there is a good reason for that. The trail towards Black Lake provides some nice overviews of the area, but it doesn’t have the same wow factor. We were planning on making a loop out of both trails though, so we ascended up the Black Lake trail to help arrive at our intended campsite at Fifth Lake a little earlier. The trail up towards Black Lake ascends up the northern side of the valley pretty aggressively which quickly yields open views of the Palisade Crest and First and Second Lake down below. On the way to Black Lake, the trail reaches a plateau where the majority of the surrounding views are blocked by trees. This means you are getting close to the lake at least. Around this point is when we began hitting our first patches of snow. Some of these patches were a couple feet deep and extremely soft, which unfortunately made them ideal for postholing. Poor Callie had never experienced snow like this and thus learned the hard way what postholing is like. Fortunately, the patches were intermittent and easy enough to walk around when needed. We reached Black Lake and snapped a few pictures from the shoreline. This lake doesn’t match the beauty of the other lakes in this area, and we were still trying to set up camp at a reasonable hour so we did not linger for very long. Soon, the trail reaches Fourth Lake. We were planning on exploring this lake more the following day, so we passed along its snowy southern shore on our way to Fifth Lake. As we traversed alongside the lake, I noticed a group of about twenty people camping on the cliffs on the opposing shore of the lake. I was quite happy they had chosen to camp there instead of finding them at our intended destination when we arrived. Fifth Lake turned out to be the perfect spot for the weekend. It was just off the beaten path enough to receive only a few day hikers, and we only had to share the lake with one other small group for each night. The lake had recently thawed out on its outer edges while the interior of the lake retained a layer of ice on top which contrasted brilliantly with the emerald blue color of the lake surface. The basin is surrounded by some of the most prominent peaks in California. Directly to the south stands Mount Robinson which towers above the lake at an elevation of almost 13,000 feet. Towards the Southeast, Mount Gayley and Mount Sill define the ridgeline seen above the Palisade Glacier. Mount Sill is over 14,000 feet high and thus caught the last rays of light for the day, which made it the focus of most of my photographs from this spot. The view was so picture perfect that I could not keep my eyes off of it. Having the view all to ourselves made it all the more special. Even Callie was transfixed on the gorgeous scene for a moment as we watched the last light of the day retreat off the cliff face. The following day started with a sunrise over Fifth Lake. I got up around 5:30 and was happily surprised with how warm the morning was. Normally, predawn at 11,000 feet in May can be pretty cold. I remember Callie’s water bowl being frozen solid when we awoke on our Memorial Day trip in 2012, but in this case, I was able to stand out in the morning air without having to bundle up much. There are so many peaks around Fifth Lake that you can see the alpenglow during both sunrise and sunset, depending on where you focus your attention. Mount Robinson received the brunt of our attention, but the view towards the west with Two Eagle Peak and Cloudripper was mighty fine as well. After soaking in the beautiful sunrise and enjoying a relaxing morning at camp, we set out for the day. We kept our camp at Fifth Lake, which allowed us to check out the surrounding area without carrying too much weight. Getting to explore the High Sierra backcountry without carrying a full backpack is always a treat, and this area is perfect for it. All of the lakes and trails are in close vicinity to each other up here which makes it easy to piece together a short dayhike with lots of destinations. Our adventure started by heading down the trail towards Third Lake, towards the junction with the Glacier Trail. Once we reached the glacier trail, we headed down it towards the Sam Mack meadow. The trail crosses the North Fork here in the middle of a meadow with a fantastic view of Temple Crag. This is a nice spot to stop and relax a bit, which ended up being exactly what we did once we saw what the remainder of the Glacier Trail was like. Once the Glacier Trail began to ascend the northern facing slope towards Sam Mack Meadow, it was immediately covered by a few feet of snow. Unlike our previous encounters with snow on the trip, there was no avoiding it here, and the prospect of postholing up a thousand feet up the slope changed our plans immediately. The Glacier Trail will have to wait for another day. Instead of immediately retreating from the snowbank, I decided that it was a worth break spot for me and Callie, so I took off her pack and snapped some shots of her as she tromped around the snowy landscape. After Callie thoroughly dogged it, we retraced our steps back up the trail and went to Fourth Lake. From the southern shore of the lake, you can see some prominent cliffs on the opposite side of the lake. This is where the large group of people were camping on the lake the previous day. Later on I would discover how nice of a camping spot that is. Most of the nearby peaks are obscured from the south side of Forth Lake, but Robinson Peak remains within clear view. Still, if you are going to linger at Fourth Lake, I highly encourage spending time on its northern side, which has much more impressive views. More on that in a bit. After a brief stop at Fourth Lake, we continued up the trail towards Sixth and Seventh Lake. This stretch of trail seemed to be the steepest of the entire hike, and at 11,000 feet it got my heart racing as we pushed upwards. The effort feels well worth it once you reach Sixth Lake though. The lake shares similar views of the Palisades from its northern shore, and it was also mostly frozen over. The area around the lake’s inlet stream was the only section of it that had thawed out. Near the edges, the layer of ice covering the lake was thinning out to create some interesting textures on the lake surface. There wasn’t a soul to be found at these higher lakes, and as I sat there on a brilliant summer day, I was overcome with an intense feeling of relaxation. We laid on the lake shore, listening to nothing but the occasional chirp from a visiting bird, and all of the stresses of normal life vanished from existence. Forget beaches or resorts, I’ll take a high alpine lake on a sunny day over anything else for pure relaxation. I became so overcome with the mood that I ended up taking a nap on the lake shore for about an hour as I absorbed the sun’s rays. It was heavenly. All good things must pass, and so our soothing rest stop came to an end. We packed up our bags and headed further up the mountain towards Seventh Lake. The official trail ends at Sixth Lake, but it’s quite easy to move offtrail up to Seventh Lake. Just stay to the north side of the lake’s outlet creek you’ll find plenty of open space. Seventh Lake was almost completely frozen over except for a small area around its outlet. I find this lake to be less impressive than the other ones in the area but it’s still worthy of a visit if you make it up to Sixth Lake. The two lakes are within very close proximity. This is the end of the line, unless you are interested in doing some ambitious offtrail travelling. Soon, we were retracing our steps down the mountain back towards Fourth Lake. On the trail between Fourth Lake and Sixth Lake, there are a couple of unmarked junctions. The first one that you run into on your descent (the one that is higher up) will take you to Summit Lake. This lake feels like the least frequently visited lake in the whole area, primarily because it is fairly high up the mountain on its own unmarked side trail. One thing is for sure, the lake’s lack of visitors is not due to it lacking any good views. Standing on the northern side of the lake, visitors are given a spectacular view of the Palisade Glacier and surrounding peaks framed perfectly right above the lake. This was one of my favorite views of the whole area and I was surprised by how easy it would have been to skip over. Summit Lake is definitely worth the little bit of extra effort that it takes to reach. Heading down the trail once again, we took the other unmarked sidetrail to see where it would take us. It turns out that this trail goes directly to the cliffs on the northern side of Fourth Lake. Upon exploring that area, I was amazed to see room for a ton of campsites. Now, it made sense why the big group of backpackers had congregated at this spot. The view towards the Palisades from the cliff was specacular as well. Even better than the one from Summit Lake, amazingly enough. After soaking in yet another jaw dropping view, we retreated back to our camp at Fifth Lake. We had explored all of the trails that were accessible, and there was still plenty of daylight left. We took advantage of the opportunity to explore new vistas near our campsite and struck gold after scrambling on top of one rock outcropping. A dazzling view of Fifth Lake opened up beneath us, complete with a perfect perspective of the receding ice on the outer edge of the lake. With nowhere better to be, we lingered in this incredible spot for awhile. Callie took a powernap while I alternated between reading a book and pinching myself to make sure that I wasn’t dreaming. As sunset approached, we made our way down to the lake to take more variations of the shot I had taken the day before. I normally try to not repeat my photography too much, but this scene was so spellbinding that I couldn’t help but keep trying out different variations of it. The following morning I chose to skip photographing the same scene for sunrise, and instead opted to “sleep in” until 7AM and enjoy the peaceful stillness that accompanies backcountry camping. This was a vacation after all. After packing up our site, we began our retreat back to the car via the lakes trail. Shortly after the trail passes the junction to the Glacier Trail, our first view of Third Lake opened up. The lake had a shade of green to it, but it was nowhere near turquoise color that it can take on later in the season as it receives more glacial runoff. That is the one downside of going here early in the season. The trail goes straight down a series of switchbacks directly to the lake, and of course we took a short stop there to enjoy a closer view. Heading down, the stretch between Third and Second Lake is short but surprisingly varied and scenic. Second Lake is my favorite lake in the area and one of my favorite lakes in the Sierra. The combination of its glacial coloring and the immense scale of Temple Crag looming behind creates a lasting impression. We made sure to take a stop here and even managed to squeeze in a selfie. Moving along, First Lake is another short stroll over a hill to even more beautiful lake scenes. Leaving First Lake was bittersweet, knowing that the trip was almost over and the best was already behind us. Fortunately, the stretch starts with some nice forest and river sections before drying out too much. The exposed stretch at the end of the hike was particularly brutal on a warm summer afternoon. We powered down the end of the trail as quickly as possible towards the promised land of air conditioning, fried foods, and cold beverages. This trip was a smashing success, primarily due to the conditions, which are close to perfect up there right now. We’ll be back in a few days. See you there? I did not get bit by any mosquitoes on this trip, but on the second night of the trip we began to get buzzed by the occasional mosquito. I killed over a dozen by the end of the trip. Mosquito season is coming very soon. There is still a lot of snow on northern facing slopes, which is clearly shown by our look at the Glacier Trail leading to Sam Mack Meadow. Plan your trip accordingly. Some of the High Sierra Passes still have a lot of snow and ice on them and should not be traversed without the proper gear and experience. Great post and wonderful pics.! I couldn’t agree with you more about sitting along alpine lakes for the greatest source of relaxation. It’s something only us mountain people can understand. Great photos, always enjoy your hiking soirées & descriptions. Heading to Mammoth this weekend with folks from NYC who have never been to the Sierras before. Will take them up the Rock Creek trail to knock their eyeballs out! Nice! It’s always fun to blow people’s minds on their first visit to the Sierra. We’ll be hiking Little Lakes Valley this weekend, so keep your eye out for the dog with the oversized red pack. Your photos of Fifth Lake are amazing! We did a trip up there a couple years ago in the fall and it is one of my favorites. Good decision on skipping the glacier. Toward the top it’s all rock hopping, which would be treacherous covered in snow. Beautiful photos and fine narrative. I look forward to your Little Lakes trip. Can you get your permit for Little Lakes in Lone Pine as you did for this trip? Tremendous narrative. Amazing pictures as always. Do you ever point and shoot or is everything done on a tripod? Most of these photos are point and shoot. I use the tripod for low light and specific types of shots. Amazing beauty out there. You’re so spoiled you probably don’t even realize it. lol. Me & my wife are planning our 5yr anniversary to come out West next year and I’m trying to decide where to go/hike. The high Sierra’s are in my top 3 places to potentially visit. Well done & terrific photography btw. Yeah, I know I’m spoiled. Wouldn’t have it any other way! That is great that you are going to come out west and explore some of it for yourself. It’s tough to narrow down a trip like that when there is so much to see. Outside of California, I recommend southwestern Utah if you haven’t been there. Why do you call this one of the most dog friendly? Do you use a filter for your water needs or do you take your supply for a trip like this one? Did you come across other dogs on your travels? Sorry for so many questions just gathering intel as I plan my next trip. I have a rescue that is a great companion not so great with other dogs and close quarter trails. Thanks again your blog is so wonderful it’s an escape from my office chair every time. – I referred to this trail as one of the best dog friendly Sierra trails mainly due to convenience and the abundance of scenery. This is the type of trail you’d expect in a National Park. – Water: I used a Steripen on this trip. I would never do a 3 day backpacking trip where I had to carry all of my water. There are lots of different types of purification, and everyone has their own preference. I like the steripen because it is very fast and it does not alter the taste of the water. Sierra water is the best. Also, Callie does not drink filtered water. Some people do choose to filter their dog’s water because they can get giardia too, but I risk it and so far so good. – Yes, I ran into a fair share of dogs on this trip. This is a pretty popular trailhead for dayhiking and fishing, so we ran into a handful of hikers who had dogs. Wonderful pictures!!!! And thanks for including a picture of yourself! Thanks Dwayne. Also, thank you for putting that extra info on your name, I didn’t realize that you had been reading. This one has to be one of my favorite of all of the ones I’ve read. Great photos! What is you mosquito solution when they get bad? Ken – The best solution is to not be in the Sierra during the peak of mosquito season. Personally, even if I prevent them from biting me, being constantly swarmed by them detracts from the experience too much and I’d rather just not go if that is what I have to deal with. Typical mosquito avoidance is a combination of clothing and chemicals. I believe that clothing should be your primary tool. I wear loose fitting hiking pants that work well at protecting my legs, and I carry a loose fitting hiking shirt to wear if needed that the cant’ bite me through. I also carry a headnet for my head and occasionally use gloves to protect my hands as well. Essentially, don’t give them any skin surface to land on, and they can bite through clothing if its tight on your skin. If they are really bad, I use a little bit of 30 percent DEET. Lastly, wind is a very effective mosquito deterrent, so you can also help avoid them by putting yourself in windy places away from stagnant water. Campsite selection is key, but it can only go so far during the peak season. This looks like a great hike! I enjoyed your pictures and narration, This one is on my list to fit in this summer. Yes, there are bears in this area. They are all over the Sierra. The black bears in the Sierra aren’t very dangerous and as long as you keep your dog away from them I would not worry about it. The bears are omnivores more interested in your food than your dog. Permits can be reserved via recreation.gov. Check out the site to see if there are any openings for the date you want. If there are none available, 40 percent are saved for walk ins. Those open up at 11AM the day before entry. The end of August is a great time to go. There will be few to no bugs, and the nights won’t be too cold yet. Just found your blog today – I think it’s wonderful! For this location, are bear canisters required? If so, can you rent them from the Lone Pine visitor center? And you mentioned peak mosquito season….how have you found mosquitos to be in Inyo county in late August and early September? Yes, you can rent bear canisters at the visitor center. Mosquitoes normally aren’t an issue from mid august to the end of summer. This year they are probably already all gone in this area by now. My wife and I have some time off April 24-26. We are thinking about doing some hiking within 5 hours or so of the Riverside area. Yosemite, Sierras, Mammoth, SEKI etc. ‘North Fork Big Pine Creek’ has been suggested to us by different individuals, but I am wondering if it is too strenuous. I would like scenic trail covering up to 8 miles total. It’d be great if it was something not too difficult that my son could hike a portion of. He has done around 4 miles on relatively flat terrain, 2 miles on some steep stuff. If dogs are allowed, that’d be a bonus, but we’ll leave them at home if we need to. Do you think we should try this trail, or do you have any other suggestions? The North Fork trail is pretty easy by Eastern Sierra standards. There are no sections that are particularly steep or difficult to hike. I think that it would be a good option for you. A couple other options: Onion Valley to Matlock Lake, Onion Valley to Robinson Lake, Cottonwood Lakes, Whitney Portal to Lone Pine Lake. I’d expect the lakes to still be completely frozen over as well. Thanks for the quick reply! North Fork trail was recommended by a trusted friend, but I saw the difficulty rating on modernhiker and decided I should ask around. We actually did a family trip to Lone Pine Lake a couple years ago before my son was walking. I’ll have to look at my stats for Cottonwood Lake and look up OV to Matlock & Robinson. 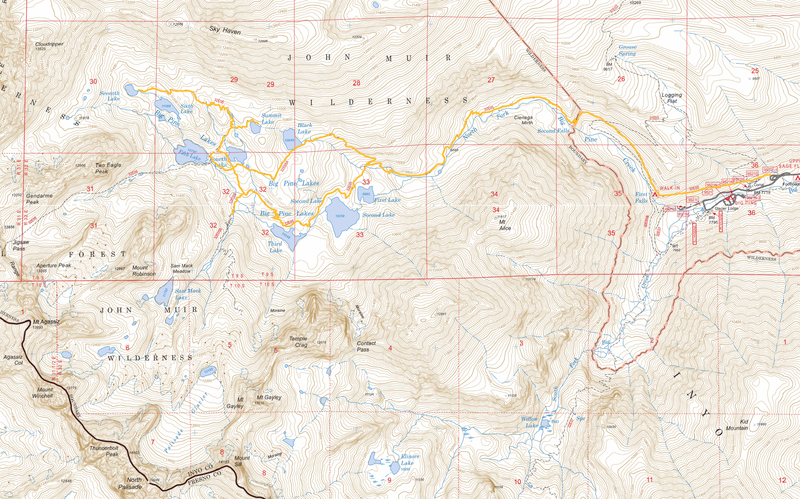 My initial plan was the 20 Lakes Basin, but I wonder if the road from 120 to the resort is even open. I was also thinking about LLV/Mosquito Flats (I’ve been there, but my family hasn’t). I haven’t heard of anyone being up to LLV so I wonder about the condition of Rock Creek Road. LLV is incredible but at 10,000 feet, that trailhead might be higher than you want for late April. I guess Cottonwood would have similar problems, but that part of the Sierra tends to get less snow. I’ve had plans to get up to the Sierra in late April for the past few years but things keep getting in the way. So, I’m not 100 percent sure what you should expect out there in terms of conditions. Beautiful site, pictures, dog and trail ! I did this trail up to Palisade Glacier about 20 yrs ago and thinking of going back with my kids/dog (who is the exact same shade as Callie!). Have you ever been up to the Glacier with Callie and if so, how did she handle it ? The last couple of miles are over car-sized boulder fields. I have never made it up to the Glacier. That was our goal for this trip but we were poorly equipped. I hope to return with similar conditions and better equipment soon. You and others refer to this area as a “basin”. Does it have a name? My wife and I did about 8 miles round trip on the trail last month but got a late start and didn’t get to the first lake. Is the view down the south canyon of Clyde and Middle Palisade Glaciers? It seems like it would be better to park at the end of Glacier Lodge Road than the backpackers lot. That is an extra mile of hiking. I’m not sure if the “basin” has an official name. The two areas are generally referred to as the South Fork and North Fork of Big Pine. You are right regarding parking. My trips here have been backpacking trips so I had to park at the lower lot, but I should clarify the easier option for day hikers since this area is great for that as well. What is the name of the campsites? I would like to reserve/permits. Great photos and blog! Are you interested in backpacking, or camping near the trailhead and doing a dayhike? My wife and I did an overnight last week at second lake. I still can’t get over the green lake color. I think 4th lake must have a different source since the water is blue. I had trouble with the sunlight “bleaching out” the grey in the mountains and in the golden hours, the lake water wasn’t very green. It seemed like the best way to photograph the lakes was from above which also allowed for darker rock. I like the way you compose your photographs. Thanks for the great pics and story. Looks like a beautiful place! I’ll be in that area in about a month to go up Whitney. I’ve never been in that part of the state so I’m looking forward to it. Your dog is super cool; a trusted companion I’m sure. Not so sure that my two pugs would make that journey. ha-ha! Absolutely loved reading your blog! Will be heading there this weekend for a day trip, but unfortunately not staying overnight. These pictures and your words make me excited for this and the following trip I plan! And yes… forget beaches and resorts. The high alpines are so much more invigorating !! Your trip report inspired be to take my son out there this summer. Could you comment on mosquitos and average temperature at altitudes during the day and overnight in mid June. I would like some hints as to which sleeping bag and how much mosquito protection should I bring, head nets or spray? We are Michigan natives so used to cold but don’t want to overpack so high up. Thank you. There will probably be a good amount of mosquitoes in mid june. Wow! I’m blown away by your crystal clear stupendous photos and your wonderfully descriptive narration. I also admire how generously you answer questions by people like us who are enthralled by your trip. Thank you for that- not many people have the patience to answer questions. I’m planning to do a lollipop loop dayhike from 1st to 5th, maybe the Palisade glacier and possibly summit lake (since you say how beautiful it is) and back down to Black Lake and the trailhead. May I know if the trail signs and the trail is quite clear or does it require some search? Any help is appreciated. Many thanks! The trails are well built and the signs are all clear in this area but it’s always a good idea to at least study the map a bit before you head out so you have some general bearings. I haven’t been too far up the Glacier Trail yet so that one might be different. I believe it becomes more of a use trail as it approaches the glacier and some route finding is required. Wonderful pictures and narrative. I’m headed there next week with a permit to spend 3 nights at Fifth Lake. Your pictures and narrative help give me some bearings prior to the hike, as well as areas to go for pictures. Thank you!